Advanced Data Validation Techniques in Excel - Switch lists, change lists etc. Data validation is a great way to keep your users informed about possible values in a cell and guide them to select something appropriate. As part of the spreadcheats series, in this post we will discuss 2 advanced data validation techniques that can help you when you are modeling a complex worksheet. PS: Many thanks to Alex who proposed this idea and solution through e-mail. The solution is to use an if() formula to determine which one of the two ranges should be used to validate cell contents. That is all, you now have a data validation list that can change its source based on user preference. You have a status tracking spreadsheet where each employee enters the status for each of the projects they are working on. They enter the status by first selecting the department and then selecting a project (from that department). So how do you do this in Excel? Remember the offset() and match() formulas we discussed in the last spreadcheats? Assuming the list of projects for each department is in a range B10:C22 with column B having the department name and column C having the project name and the list is sorted on column B, we can use offset() and match() combination along with countif (ahem!) to determine which range to use for project cell drop-down. What is above formula doing? It is fetching a sub-range from the by finding where the first entry for the selected department is, returning x number of rows from that point, where x = no. of projects in that department. That is all. You now have a list drop-down that changes values based on what is selected in an earlier cell. Feel free to download this example workbook containing a tutorial on Advanced Data Validation in Excel and poke around to learn. Let me add that usually you should have those lists in a "control" or "support" sheet, creating a named range for each list. Then you could enter: If($B$7="Full List", range1, range2). Just a bit cleaner. @Jorge: You are right... using a control sheet is always advisable. I am trying to use the OFFSET proposed formula =OFFSET(C9,MATCH($B$6,$B$10:$B$22,0),0,COUNTIF(B10:B22,$B$6),1) but doing "reference" from a another sheet in the same woorkbook. (3)Whatever data updated on the data range, the same will be automatically update in Data Validation list in separate sheet. @ Jorge & Chandoo == Thanx for nice idea. Without naming the range, control/list from other sheet does not work. i.e. all the similar areas are to have one after other OR need to sort on area. That's why it says in the solution that "the list is sorted on column B". @Ketan: you are right The list needs to be sorted as I have noted in the article. There are some solutions involving array formulas (shudder) etc. to overcome this, but I always try to keep these things simple so that anyone can understand and use. As such I am no good at array formulas myself and don't venture in to them unless they are the only option. Since we are on the topic of named ranges (well sort of) can someone tell me an easy way to rename a named range? I have a report where it would be really helpful to use a named range in my vlookup but the range varies month to month..
@Cheryl... thank you. did you try using indirect or offset functions in the named range definition. That way even though the names stays same, you can change the range it refers to by simply changing value in a control cell. Let me know if you have trouble in doing this. I can elaborate on this. @Azmat: hmm.. resetting value on previous selection... I guess you can use VBA to get this effect. But you wouldnt probably want to use vba. I dont know other ways around this. Does any one know how to reset a data validation enabled field when some other cell changes? I have not, but I know you did have a posting about those recently. I will check that out! Thank you. Have a simpler version of this solutions. 2. For each of the projects define a named range with the department names. This works as well. Thanks. Hey in all the above examples the 'list' is in the same Excel file. What will I do if my 'list' is another Excel file? Name your list first and then in validation box type the name of your list. Let's assume you name your list as LIST. So in validation box type as =LIST and it will work. Please reply with your reslut. Why is it that if you extend the Range ($B$10:$B$22) to for example ($B$10:$B$33) it gives you wrong output? @Darwin .. Are you sure you have edited the range in all places? If I select Marketing, the resulting list includes Projects under Ops Area. I sent you an email with your sample data and additional rows in your gmail. @Darwin... Did you sort the list by department name? It seems to work fine for me. Got it! I should have paid attention to the comments here. Thanks! Can anybody tell me about calender of date option in data validation, when I wish to put any date then calender should appear on screen. @Adnan... I think you have to use a bit of VBA to show calendar control to let user enter valid dates. Am a Silent reader of your posts and this blog..Its quite interesting and very useful for me.. In the above post, using Indirect(Cell reference) also works very well...The referenced cell may contain any one of the Name.. This is excellent - really helped me out. However, still a little stuck I'm afraid. I have 7 lists in total, each needs to feed off the preceeding list. Can you give me some guidance on what I need to have in the data validation cells from list 3 - 7 so it includes all of the previous entries? Additionally, there is some overlap in each list (i.e. I have one list titled Region, where Global is seen in more than one of the preceeding categories). Right now, when I click the drop down list I get multiple Global's rather than just one. Any thoughts? I've been working on this for ages now so any help you can give would be great! What if I have problem 1 in problem 2 above? To explain, If my list under marketing is too big and I only want to see only the items that are frequently used instead of all available items, how should I amend my formula? The data has to be in the same worksheet i believe? usually a separate worksheet is used for reference. could you clarify how do you go about it? It doesnt work if you reference the data from a different sheet. the control page or something mentioned is not clear to me. I am not too sure if i can use data validation with the problem that i have. I have a data enry of around 5000 rows in 1 sheet and i want to be able to select a person randomly after applying auto filters. say for example, i want to select a name randomly which is in coumn D after filtering using other columns which shows me who is attended a specific course, meeting etc. Please help in creating Data Validation which accepts only text. Please Note: It should not accept text and number combination. I have created a file with data validation. In a column there are over 75 entries in a drop down data. One has to scroll through the list to select an entry. Is there a way by which just by entering the 1st letter or the 1st two letter, the drop down list shownall the data with these starting letters so that the selection becomes easier. My thanks in advance for this guidance. Excel doesn't have an Auto Complete facility in Data Validation. But with a bit of careful planning you can achieve the same result. If the lists are as follows what is the expected list in first dropdown? All of these techniques can be automated if required. Thanks. I tried to use the Pivot table technique and it worked. Further question on the same. The lists are in Column H and I starting from row 4. F9 contains the first drop down. G9 contains the second dropdown. Pivot is located in Column M starting from row 13. Now is it that I need to delete the pivot table, create a new one and then use it? Or is there any technique by which I can dynamically grow the pivot table? If the pivot table is based on a Dynamic Range, then refreshing the pivot table will add the extra items. how do i do the same if there are more than 2 columns for eg , country, state, city. I want to be able to use data validation where the restricted input would be either a number greater than 0 or the text "na". I tried using an OR statement, but it didn't work. Not sure if I just had bad syntax or if I can't do it that way. Any help would be appreciated. how to generate a list of non-repeating combinations, with some values sums off, and some values on, beside show how many evens and odds numbers. Here is my scenario I'm trying to find a solution to - any input would be greatly appreciated! Is there a way to see the text "Apples" in the dropdown, then once you select it the cost code "123456" would populate and not the Apples text? In the 'Data Validation - Change Lists' - What if I have multiple 'Select Area' and 'Select Project'? How to apply the formula in each and every cell in the column with same data list? Your speadsheet shown only one cell of 'Select Area' and one cell of 'Select Project'. I just used pivot tables to extract the data. it will remove the duplicates. Then reference the pivot table for your drop down? I need to find out what formula should I put in my data validation in Col B so that when TaskA is selected, I will only see "BAU" and "PRJ" in the dropdown list and "PRJ" should come only once. When TaskB is selected, I will only see "BAU" once. Presently with your solution I can only get to the stage where BAU will appear 3 times, if TaskB is selected. and only 8 are visible in pop up window. I would like to disable this and have biger tab offering me all 10 (I am aware if bigger list i might have difficulties to pick one I need. Problem 1 didn't work as explained. The data validation list only shows the false statement part and didn't even the have Full List word showing on the List down menu. Any advise??? I am looking for a formula so that an error message is returned when incorrect data is entered into the cell. If the adjacent cell on the left contains the data CY+3 (or any other number)or the data IND+0 then this particular cell CAN NOT contain the data EVT (or EVT+ any number) and an error message should be returned. I then wish to copy this down the column. Please help! I am pretty sure this is possible. I used to be a wizz with excel formulas but I haven't used them for almost 10 years now! Change list values based on what is selected in another list? what will be the best way to do it? I am using the second formula using offset and match and it works fine when the list is sorted. My list is sorted but there may be instances when it is not. This formula doesn't then return the correct values. Do you have any ideas how to get around this? In the second problem, how do one allow for the user to enter data freely in the project list? E.g. in my sheet the user can first choose between the areas "marketing", "sales", "ops" or "others". If the user selects one of the first three he will get a new list to choose from in the "select project cell", but if the user selects "other" he should be able to type in whatever he wants in that cell. In SITUATION1, when selecting a value of the "Partial-list-range" the data is not recognized as invalid data. But selecting "FullList" (SITUATION2) and then a value of the "Full-list-range" the cell is circled and marked with a Data Validation Error. Saying "Restriction: Value must match one of the listed items". I have googled my a** of to find anything about this problem or a workaround or sth., but without succes. I was not able to teach excel that a value of either the one or the other list is valid. Is it possible to limit the data range depending upon value selected in drop down list. Suppose i have a drop down list (say in cell M1)which has 5 options, namely Refrigerator, TV, Mixer, Micro oven, Speaker. Now i want to limit the data entered in cell X20 depending upon the option selected. Is it possible to do in excel 2010? If it is possible, tell me how to do it. But there is a problem. I can still Copy paste the data above the maximum limit. Let say for TV maximum limit is 800. In some other cell (which is not Protected) i wrote 1000. Now i copied that 1000 and paste it into the validated cell. And it is showing 1000 as input. Can you tell me how to protect it from copy paste option? I have tried making Fields instead of point to a specific cell, but this brings me errors. Is there a fast way to copy the "equation" while changing cells to fit reference cells per row? Right now, I am manually changing all of them. Way too much time for what I am doing. It worked! You guys are great! I look forward to learning more from you in the future!! Thank you sir. I will give it a try. Will let you know. I LOVE this site! You guys have a ton of great info. Thanks so much! It worked. You guys at Chandoo.org are the very best! I look forward to learning more! Thanks so much! It worked. You guys are the very best! I look forward to learning more! How do i get cell D6 in Sheet"Data Validation - Change Lists" to revert back to blank if the selection in cell B6 has changed? I would like to validate if cell d7 contains "C" or "F". In case "C", cell G7 can get a value, but in case of "F", cell G7 should be locked, or a error message shoudl pop up. can this be done with data validation? I would like to create a ONE to MANY drop down list. E.g. I have a sheet with the first drop down as COUNTRY, after selecting country I would like multiple other lists to be dependant on this first selection, so BLOCK or CONTRACT lists should refer to the selection in COUNTRY and then the options reflect the chosen COUNTRY, is this possible? I can create 1 dependant list using the INDIRECT formula without problem but I cannot get any additional lists created that are dependent on the first selection due to not being able to define the names in the same way, i.e. select UK as country then the next list is defined by UK but I cannot create a third due to not being able to name another list as 'UK'. Great, thanks for pointing me in the right direction. Nice site too by the way, lots of helpful stuff on here. I’m used your formula for a data validation. I’ve just adjusted the range’s of data to reflect my lists, however it seems out of sync by 1. Instead of the dropdown returning E6:E10, it returns E7:E11. Thanks in advance for your help… any suggestions at all? At work recently I changed some information in 2 cells that I had filtered and it changed all the cells in between too. How can I avoid this happening again ? please help me how to make it automatically appear in the other sheet. 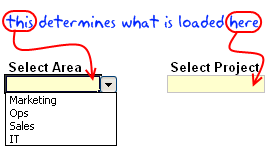 ahmmm ill change " this determines what is loaded here " to "This determines what is going to appear here". thanks! I am trying to prepare a macro for an excel sheet. I need to know how can i change the data in various cells on changing the selection from a drop down list. I am trying your worksheet example, applying Table Nomenclature. The formula works out fine when reviewed (in Edit Mode, a "F9" over the entire formula). But when the same is pasted to the data validation, excel compains there is a mistake in the writing of the formula and does not allow it. May I suggest that in your example worksheets, you also provide examples using "Table Nomenclature.."
I know that Excel does not allow auto completion in a data validation cell. There are several workarounds, but I cannot seem to get them to work. Does anyone have any simple suggestions. I am using offset+match+countif in my validation list and I am able to get the correct range of list. However, even tough I have checked the error alert box in the data validation, there is no error message prompt out if I manually input wrong description. I wish there is error message prompt out if I input invalid data, does anyone have any suggestion? I have a spreadsheet that is updated very frequently. At any point in time I will need to print out data that has been collected today (=Today() ). Once printed, only fresh data with Today's date will be printed and not any previous data. Thx , this is what i looking for. I was trying to do Problem 2 - "You would like to change a list’s values based on what is selected in another list"
My problem is I can't create the drop down in the second column (the projects, in column D). The formula only works if I enter it in the cell, but then I get the full list, not a drop down. I have a spreadsheet that works on a value entered in one box then generates a unit number in another so e.g. No of units = 10 it gives you 10 cells underneath labels U1-U10 under these are drop downs that give you option of small - large per unit of which then the selection returns a value of pages 30-90 to allow us to cost the units, The problem I have is that if you select 10 units max select the small - large drop downs it works fine but if you then change the 10 to 5 units the units headers disappear but the drop down list below remains and stays stuck on the previous selection so still brings in a page number and therefore a calculation of costs. Is there a way to refresh and remove the drop down when the header above is not there. The drop down is dependent on the unit header been above. I am using a list box (form controls) which is for listing the months. Is there any way I can make the list dynamic ie., for July, the list will show Apr. to Jul. Next month, it will Apr. to Aug. so on. Alternately, pl. suggest the way forward in Data validation. 1. I have applied data validation rule to a range of cells to accept only decimals between 0 to 30. It works well, but it accepts other values when copied and pasted to that range. So, how do I restrict copy-paste on those cells? 2. i stored marks of students out of 50. Data validation check is applied to restrict user from entering wrong values too. but now it does not allow me to place "ABSENT" to some cells. So, How to add multiple checks to data validation? i would like to limit the entry for drop down list. Example. I have 4 names in the list drop down. the moment i choose more than 2 times the same name it should show me an error and not allow me to choose the same name. Can i know how to go about it. I have 2 validation drop down list. Second validaion drop down list is based on first one. Validation is working fine for me. My question is if I change select any value from first drop down, in second i get the correct list, but I get selected value from previously selected option. Example: If I have firstname and lastnames in first drop down list, if i select my name "Gagan" from first list then i get "Chawla" from second list which is correct, but if I change first one to any other name, I see "Chawla" already in cell how to change this? So that i someone forgets to change dependent list, it should be blank? First of all I love your emails and all of your tips. When using a formula as the source for a list in Data Validation and it is longer that the text box, is there any easy to edit any portions that are beyond the edge of the text box. I can place the cursor at the far right and then press the right arrow key but it always adds a cell reference that I then have to take out. I can they make my changes. Is there a better way? I have the 1st file that list the employee names, their designations and their departments. In the same file under Name Manager they are saved as per departments (Name Tele refers to =test!$B$13:$B$25) (Sales refers to =test!$B$27:$B$43) and so on for the other departments. I have put validation in my spreadsheet. I want to get an update on my mail, when ever that validation value will change. How to do it.